Junior Jordan Early cheers on the sidelines at the Westwood football game. Let´s hear it for the best … B-H-S! 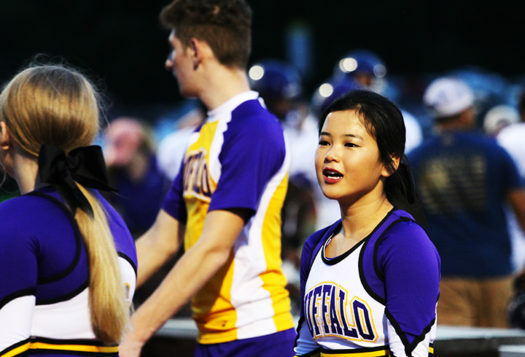 Junior Jordan Early is a first-year cheerleader for the Bison. Being able to cheer with her sister, Jazlynn Early, motivated Jordan to try out her sophomore year. Early was initially on the volleyball team because she had played since seventh grade. However, she gave up that sport to focus on being the top of her class and cheer. Jordan is currently ranked in the top 10 percent of her class. She plans to attend the University of Texas in Austin. When Jordan is not busy with cheer and school, she likes to watch Netflix and YouTube. Her favorite shows include Teen Wolf, The Kissing Booth, and The Ranch.